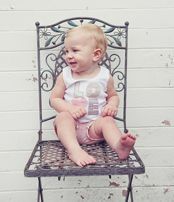 engagement, weddings, anniversaries and Valentine's Day outfits for babies. Nothing is sweeter than dressing babies up to celebrate special days and we have a sweet set of baby clothes and cute baby outfits to make anniversarys, weddings, engagements and Valentine's Day even more special. 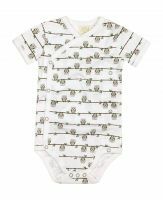 Charming Love Henry Bird Onesie with little cap sleeves. Looks so lovely on can be paired with a pair of shorts, leggings, skirt or just left by itself. Classic Love Henry Digby Outfit With Chambray pants, Dark Navy Sewn on bracers, White t-shirt and Cherry Red Buttons.